One of the most widespread natural fibre ropes in use today, as well as throughout history, cotton rope is versatile and surprisingly strong. At Rope Services Direct you can order bespoke cotton rope of any length or specification. See our full natural fibre rope line up for other material options. Amongst the twine and cords we sell you can buy cotton cordage that is of the exact length that you need. This natural fibre rope is a sustainable and practical alternative to synthetic products, whether you need it for a creative project or a commercial purpose. Cotton is a versatile material, so it makes a sensible choice for constructing rope. As well as being sturdy enough to bear heavy loads, it is also relative light and fairly flexible, so it is less likely to fray or snap. 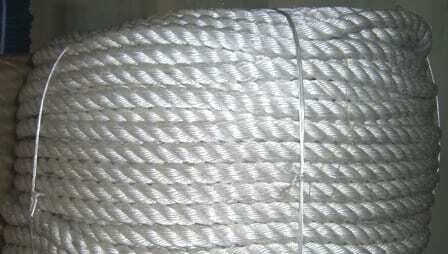 Rope made from cotton is frequently used for sash cording, climbing rope and circus trapeze ropes. Our wire rope offers higher load bearing capabilities, if natural fibre ropes like this are not fit for your purposes. Another major advantage of cotton cord and rope when compared with other natural fibre ropes is that it is very absorbent, which makes it well suited to soaking up dyes and retaining its chosen colour. This absorbency has the obvious drawback of meaning that other substances, such as oils and liquids of all types, will be sucked up into cotton rope. Over time this can lead to the degradation of the material and limit its lifespan. Because of this, cotton rope is not ideal for every environment, but will work well in places where it is not going to come into contact with water. Natural fibre ropes made from sisal are a better choice in this case. Some natural fibre rope can look a little dull, but this is not a problem when you pick cotton rope thanks to its ability to absorb dyes effectively. This means that it can be coloured in whatever way you wish, helping it to blend into the background or stand out as an eye-catching statement. Cotton rope is a lightweight option, as well as being fairly flexible and capable of stretching without snapping. Its surface is fairly smooth and soft, so it will not leave you with scratch palms if you decide to handle it for long periods. Where it falls short is durability, as it is susceptible to losing its integrity when exposed to liquids, chemicals and other environmental hazards. If you want to stick with natural fibres, our sisal rope is a sturdier option. If man-made fibres are preferred, we sell polypropylene rope with excellent properties of durability. Still in the dark about cotton rope and want someone to show you the light? Contact the Rope Services Direct team by calling 01384 78004 or emailing us. We will endeavour to answer your questions clearly, concisely and quickly. Cotton Rope Overall rating: 5 out of 5 based on 6 reviews.